Morgan said this particular playground was established by means of a partnership between Rotary Club Bocholt, Lüderitz Town Council and the Rotary Club of Lüderitz. She said they are focusing on the wellbeing of the youth by building playgrounds, with the aim of keeping children off the streets and away from drug abuse and violence and to create a safe environment, where children can play together. The Rotary Club of Lüderitz will open two other playgrounds, one of which will be in Aus, as the owners of Klein Aus Vista indicated their willingness to help with the upkeep and maintenance of the playgrounds. The other will be set up at NHE location in Lüderitz. Morgan said they unfortunately still have difficulties regarding the playground in the NHE area, as the erf allocated was not suitable and they are waiting on Lüderitz Town Council to identify an alternative erf, or to assist with other options. 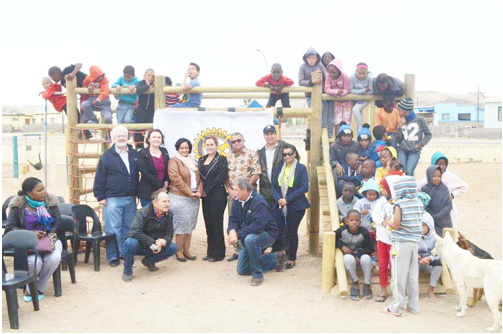 At the same occasion Deputy Mayor Brigitte Fredrick applauded the Lüderitz Rotary Club for setting up and upgrading the playgrounds in different locations and at primary schools. Fredrick said playgrounds have a very vital role in every community, as places where children can play safely and make friends. A playground is also a place where children keep busy with play, rather than engaging in counter-productive activities. She said the revamped playground would help create an atmosphere of playing together without discrimination and cultivate the spirit of togetherness, known in Africa as ‘Ubuntu’.